It all began so quietly. First, the sparse reports on the news networks, vague hints of new troubles in the Middle East. We had no idea what was coming. No idea at all. Israel went on Thursday and Iran followed soon after as America answered the strike against one of their allies. North Korea took advantage of the devastation and world-wide confusion to destroy their southern counterpart. Danielle stood still, watching the flare as it dropped out of the stratosphere, resembling nothing so much as a shooting star without the wish. India and Pakistan both launched within minutes of each other, and China was most likely responsible for the appalling strikes on the North American continent. In the end, it didn’t matter who pushed the buttons; it mattered only that they were pushed. Danielle watched the flash, the fatal millisecond where peace ended and insanity began. She felt her eyes burn, darkness descending as the breeze sprang up, foreshadowing things to come. 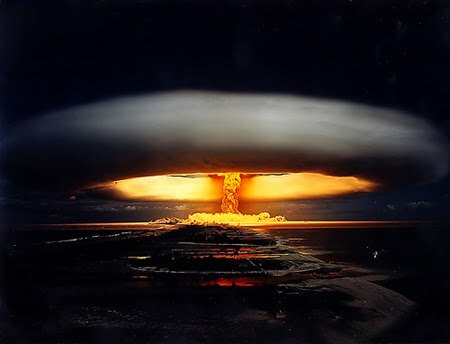 Danielle stood still, imagining the mushroom cloud as it grew. Danielle stood still as the ill wind blew her away. Ooooh, creepy. This was genius, but I feel bad for Danielle!